Funny how, whenever I'm about to throw a party, I suddenly notice serious funk that I've been ignoring overlooking for far too long. While going through the motions of my standard sink/toilet/countertop cleaning the other day, I realized that the grout in our downstairs bathroom was looking pretty foul. As always, you know me—I got to researching. We're a modern family, steering away from harsh STANKIN' chemicals, so I was on the hunt for a safe, natural way to take the funk outta that grout. And I found it. Easy peasy, friends! My husband always insists that I save all old toothbrushes. His hoarding came in handy here, as I grabbed an old child's toothbrush, a bowl of baking soda and a spray bottle full of a 1/2 & 1/2 white vinegar/water mixture. 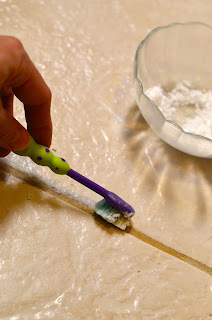 Simply wet the toothbrush and disperse baking soda onto grout. Make a thick paste by combining baking soda and vinegar and scrub into the grout. Then spray the white vinegar/water mixture onto the baking soda. The mixture will begin to fizz. Use your toothbrush to scrub your bubbly concoction into the grout. For stubborn stains, I let the mixture sit for a few minutes and then reactivated with another white vinegar/water spritz before scrubbing again. I was so impressed with how safe and effective this method was, and would absolutely recommend giving it a try before holding your breath through use of expensive, harsh, noxious cleansers. Try it and report. You're gonna be psyched at the results, and the fizzing reaction makes this process kind of (dare I say) fun! Here's to spiffing up your grout without the headache of horrendous chemical stenches. This method really worked—on the walls, the floor, the backsplash! Have a wonderful, squeaky clean day, friends...and if you have any other great, safe ideas for household cleansers, send them our way! My bathroom tiles were a sight for sore eyes: the grout was stained and looked filthy. Sadly I couldn't afford to replace the grout for the entire bathroom. I found out about Nugrout products and decided to give it a try. I am amazed by how new my bathroom now looks with the new grout color, and how affordable the entire process was. Check out their website at http://www.nugrout.com. I highly recommend them.